This dataset contains a list of the active drugs in the Medicaid Drug Rebate Program and specifies the manufacturer status in reporting or not reporting the Average Manufacturer Price. A report should be issued for each active drug in the program, otherwise, penalties may result. The present dataset contains a list of the drugs included in the MDRP stated as “Reported”or “Not Reported” according to the submission status of the AMP. The Medicaid Drug Rebate Program is a program that includes CMS, State Medicaid Agencies, and participating drug manufacturers that helps to offset the Federal and State costs of most outpatient prescription drugs dispensed to Medicaid patients. Approximately 600 drug manufacturers currently participate in this program. All fifty States and the District of Columbia cover prescription drugs under the Medicaid Drug Rebate Program, which is authorized by Section 1927 of the Social Security Act. The program requires a drug manufacturer to enter into, and have in effect, a national rebate agreement with the Secretary of the Department of Health and Human Services (HHS) in exchange for state Medicaid coverage of most of the manufacturer’s drugs. When a manufacturer markets a new covered outpatient drug, it must also submit product and pricing data concerning the drug to CMS via the Drug Data Reporting for Medicaid (DDR) system. This ensures that states are aware of the newly marketed drug. In addition, Section II(g) of the Rebate Agreement explains that manufacturers are responsible for notifying states of a new drug’s coverage. Manufacturers are required to report all covered outpatient drugs under their labeler code to the Medicaid Drug Rebate Program. Manufacturers may not be selective in reporting their NDC’s (National Development Council) to the program. Manufacturers are then responsible for paying a rebate on those drugs for which payment was made under the state plan. 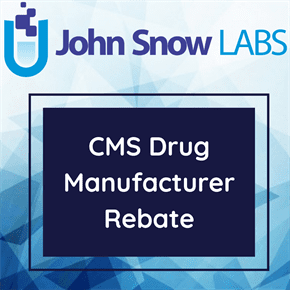 These rebates are paid by drug manufacturers on a quarterly basis to states and are shared between the states and the Federal government to offset the overall cost of prescription drugs under the Medicaid Program. In addition to signing a national rebate agreement, drug manufacturers are required to enter into agreements with two other Federal programs in order to have their drugs covered under Medicaid: a pricing agreement for the Section 340B Drug Pricing Program, administered by the Health Resources and Services Administration, and a master agreement with the Secretary of Veterans Affairs for the Federal Supply Schedule. Please note that in accordance with section 1927(a), in order for payment to be made available under Medicare Part B for a manufacturer’s covered outpatient drugs as defined at section 1927(k)(2), the manufacturer must enter into a rebate agreement. Innovator Drugs – the greater of 23.1 % of the Average Manufacturer Price (AMP) per unit or the difference between the AMP and the best price per unit and adjusted by the Consumer Price Index-Urban (CPI-U) based on launch date and current quarter AMP. Blood Clotting Factors – the greater of 17.1 % of the AMP per unit or the difference between the AMP and the best price per unit and adjusted by the CPI-U based on launch date and current quarter AMP. Drugs Approved by FDA Exclusively for Pediatric Indications – the larger of 17.1 % of the AMP per unit or the difference between the AMP and the best price per unit and adjusted by the CPI-U based on launch date and current quarter AMP. the total number of units of each dosage form and strength of the line extension drug (section 1206 of HCERA, which replaced section 1927(c)(2)(C) as added by section 2501(d) of PPACA). Cap on Total Rebate Amount for Innovator Drugs – The limit on the total rebate amount for each innovator drug is at 100 percent of the AMP. Centers for Medicare & Medicaid Service. Medicaid Drug Rebate Program. Published February, 2015. Accessed February 23, 2016.